The Government is not preparing for a hard border on the island of Ireland post-Brexit, a spokesperson said. The spokesperson said that Ireland and the EU were at one on the matter. The statement added that the EU had been clear that it was determined to do all it could, deal or no deal, to avoid the need for a border and to protect the peace process. It said the Government, with the EU, remained committed to avoiding a hard border on island of Ireland, adding that the integrity of the EU's Single Market and Customs Union and Ireland's place in them must also be protected. The statement added that the Government had always said that the best way to achieve this is as part of the negotiated agreement. If the UK decides not to ratify the Withdrawal Agreement, achieving these objectives would become more difficult. "Detailed discussions are being intensified with the European Commission while discussions with the UK will also be required given its legal obligations. "And as co-guarantors of the Good Friday Agreement, the British and Irish Governments will continue to have obligations under it, including to ensure peace and stability in Northern Ireland." 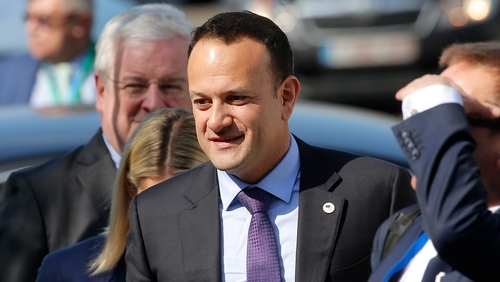 Earlier, Taoiseach Leo Varadkar has said he is still confident and believes there will be a deal on Brexit, but a no deal Brexit has become more likely. Speaking to reporters in Dublin, Mr Varadkar said the Government has stepped up preparations for a no-deal Brexit and that work has already been going on for months and years. However, European Union officials in Brussels have said a no-deal Brexit is "becoming increasingly likely". Minister for Finance Paschal Donohoe said that he still believes an orderly Brexit is likely. Mr Donohoe warned that the only deal on offer is the one already negotiated between the EU and the UK. Speaking on RTÉ’s Today with Sean O'Rourke, he said that if the UK crashed out of the EU, then 50,000 fewer jobs would be created in Ireland over the next four years. Mr Donohoe said the economy will still grow but at a slower rate. He said the Brexit Omnibus Bill has been passed, which will deal with any disorderly Brexit. Mr Donohoe added that it was still his intention to continue with depositing funds in the rainy day fund. Tánaiste and Minister for Foreign Affairs Simon Coveney said the claims from Brussels that a no-deal Brexit is becoming increasingly likely are because there are only a few weeks left to the next Brexit deadline and there is no solution reached. Mr Coveney said he believes there will be a lot more clarity following this week's parliamentary sittings but the sooner there is clarity, the better. He added that he believes there is a strong majority in Westminster who do not want to see a no-deal Brexit. Speaking in Cork, he said the Government has been intensifying its no-deal Brexit planning and the country will be as ready as it can be but it is continuing to focus on getting a political solution. "The British parliament and government has to find a way of voting for something as opposed to against things," he said. Asked how it is possible to protect the Single Market and avoid a hard border, the Tanáiste said these are not incompatible objectives. It has to be done on the basis of regulatory alignment and in a no-deal scenario, he said, the UK government has made it clear that the British, Irish and EU will need to work closely together. He added that it is not true to say that EU leaders - in particular German Chancellor Angela Merkel - do not believe their assurances. Asked about giving business certainty about their plans in the face of a hard Brexit, the Tánaiste said the Government does not control "all the levers here." He said "all the levers we do control we have acted upon in terms of contingency. Unfortunately, the only certainty that is left to deliver at this stage is from Westminster, not from Dublin, not from Brussels." Meanwhile, Minister for Business, Enterprise and Innovation Heather Humphreys encouraged businesses to make sure they have the adequate cashflow to see their operations through Brexit. Cashflow problems could arise for business for a variety of reasons including currency fluctuations, customs, potential delays and tariffs. Minister Humphreys said that hundreds of companies - from online hardware businesses to IT companies - have taken the first step of making sure they are eligible for the Government’s €300m Brexit Loan Scheme. She said that even if firms are unsure if they will draw down a loan, she urged them to go through the application process so that they have one in place in case it is needed down the line. "It's better to be safe than sorry. The increased cashflow, if drawn down, will give them breathing room in the form of accessible working capital to mitigate any Brexit impacts on their business," the minister stated. The scheme is open to all Brexit-impacted companies and is part of a package of measures the Government is working on to ease Brexit pressures on business, such as the recent decision to defer VAT payments in the event of a no deal Brexit. The Future Growth Loan Scheme, which will make up to €300m of loans available with a term of eight to ten years to support strategic long-term investment in a post Brexit environment, will also be launched shortly. Companies should now contact their financial providers or look to the range of state supports available to them.